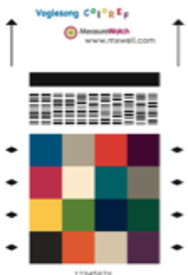 Please do us the favor of emailing us, to indicate your preference for one of the above color combinations for the CRM, or your idea for another combination. We also wish to enhance the capability of the Voglesong Coloref by adding a patch that simulates M1 on the ISO standard, accounting for Optical Brightening Agents (OBA). Please contact us if you wish for us to add this. WE AIM TO PRODUCE STANDARDS OUR CUSTOMERS DESIRE, So Let us know!! The Voglesong Coloref in its business card size format, readable by hand held spectrophotometers is available now from In T'Hutch Ltd. The cost is $200.00 US. The scanner configuration is available now in the CMYK format, at the same price. At this time we are setting up a form on this website, which will allow online ordering and payment by credit card. Until we activate, please contact us at hutch@inthutch.com to order, pay, and/or get more information. We accept company PO's, company checks and Mastercard, Visa and American Express.